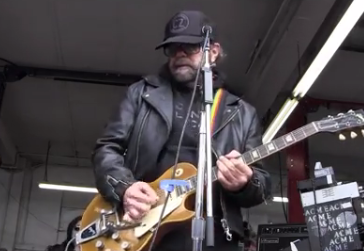 Daniel Lanois’ Performance at Master Mechanic High Park and Dundas West Animal Hospital’s Woofest was beyond mesmerizing and a wonderful addition to such a joyous day. Daniel surprised our very own Josie Candito with a wide “open heart” mention of her at 2 points in his performance! “There was a girl at master mechanic her name Josie she knew the tricks. She let herself down when she heard the news…”Daniel Lanois went off to finish the set after some killer sound effects by ensuring that all the puppies were adopted then playing his last song called JJ Leaves Ronces. In the end, Daniel goes on to thank the crowd and speakers and especially Josie and her selflessness. He mentions her helpfulness in the community and her honesty and fairness as a mechanic. We are very proud!